Highlighting the applications and notations of basic mathematical concepts within the framework of logic and set theory, A First Course in Mathematical Logic and Set Theory introduces how logic is used to prepare and structure proofs and solve more complex problems. 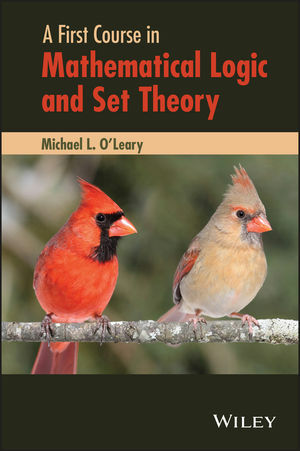 An excellent textbook for students studying the foundations of mathematics and mathematical proofs, A First Course in Mathematical Logic and Set Theory is also appropriate for readers preparing for careers in mathematics education or computer science. In addition, the book is ideal for introductory courses on mathematical logic and/or set theory and appropriate for upper-undergraduate transition courses with rigorous mathematical reasoning involving algebra, number theory, or analysis. Michael L. O'Leary, PhD, is Professor of Mathematics at the College of DuPage in Glen Ellyn, Illinois. He received his doctoral degree in mathematics from the University of California, Irvine in 1994 and is the author of Revolutions of Geometry, also published by Wiley.